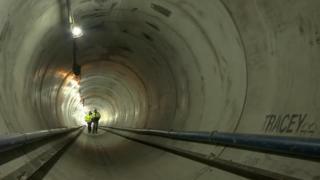 Image caption Construction workers described the project as "challenging"
Engineers constructing a pipeline to supply drinking water to people in Cumbria have given a glimpse inside a 0.8-mile tunnel (1.3km) created as part of the £300m project. The Castlerigg tunnel, near Keswick, is 65ft (20m) below the surface at its deepest point. It is part of a 62-mile (100km) network from Thirlmere in the Lake District to properties in the west of Cumbria. United Utilities aims to complete the scheme by 2022. The pipeline is being built as the company has to stop taking supplies from Ennerdale Water by the end of March in 2022 to meet environmental regulations. It took about five months for a satellite-guided tunnelling machine to clear tonnes of rock from the tunnel, starting in August. The firm described it as the "biggest and most challenging piece of engineering" in the entire scheme. Project director John Hilton said the line would provide a "resilient" water supply to homes and businesses in the Whitehaven, Egremont, Maryport, Cockermouth and Wigton areas. The next stage will see pipework installed to carry water from the reservoir to a new treatment plant at Williamsgate, near Redmain.